The trip from Phnom Penh to Siem Reap by bus has improved by leaps and bounds during the time I have lived in Cambodia. The once bumpy road is fully paved now, and in 2019 the trip now takes between 5.5 and 6 hours. But between the view of the Cambodian countryside, the smooth ride, and onboard WiFi, this is one of the best ways to travel across Cambodia. We took this gleaming Giant Ibis bus in 2019 and it’s still a great ride. Schedule: 8:45 a.m., 9:45 a.m., 12:30 p.m.; night bus 11 and 11:30 p.m. Giant Ibis Transport began operations in 2012 and offers a variety of services that will appeal particularly to visitors. Their fleet of buses is new, the seats recline, they offer free WiFi, power outlets, a bottle of water and a pastry and their staff speak English. They are also the only full-size bus company in Cambodia to offer seat belts. 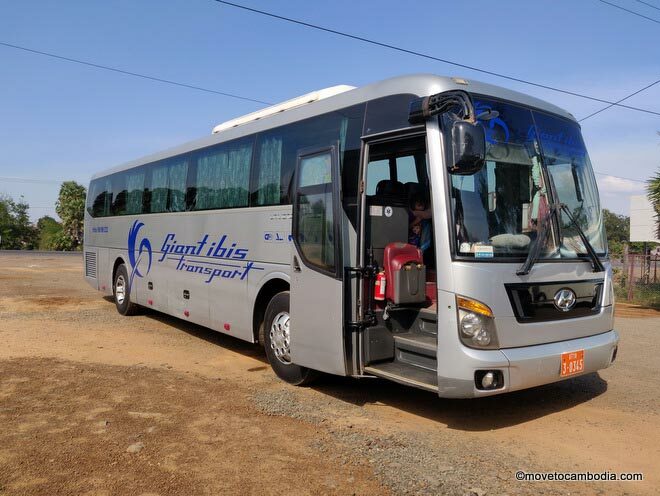 Best of all, they offer online booking and seat reservation, thus eliminating the 30-odd minutes one would usually have to spend at a Cambodian travel agent’s while they call the bus company and laboriously write out a ticket. The trip from Phnom Penh to Siem Reap takes about 6 hours give or take about thirty minutes. 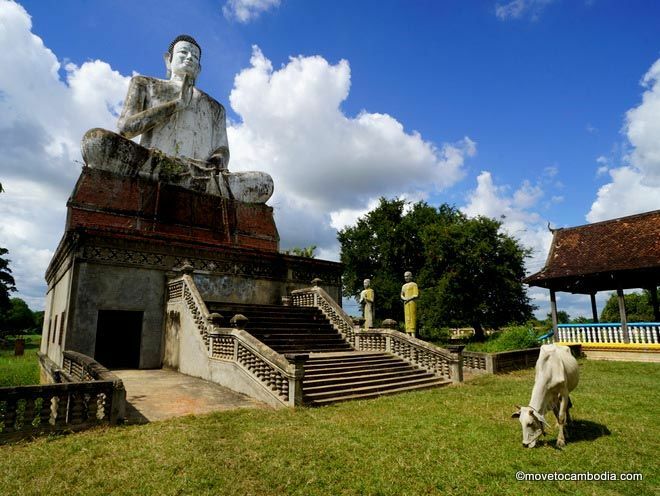 It’s a nice way to see a bit of the countryside; along the way you’ll see traditional Khmer homes, family gardens, rice paddies, flocks of ducks, and water buffalo being led home. The 38-foot buses seat 41 passengers and while there are no toilets on board, the bus stops at the 1.5 and 3.5 hour mark. The first stop isn’t always the same, but always has a relatively clean Western toilet. The other stop is a restaurant contracted by Giant Ibis called Banyan Tree on National Highway 6 near Kampong Thom. Don’t worry, you will stop for lunch. While on one hand, it does feel like a bit of a hustle to be forced to sit at a bus company-contracted restaurant, there’s no way of avoiding this. Every bus company in Cambodia stops at places that pay them for the business, and it will even happen when you take a private taxi. The plus side of Banyan Tree is that they have the same prices for Khmers and foreigners, which is not typical. The food is ordinary, and prices are higher than you’d expect in Cambodia, but still not very expensive (dishes are priced between $3 and $5). 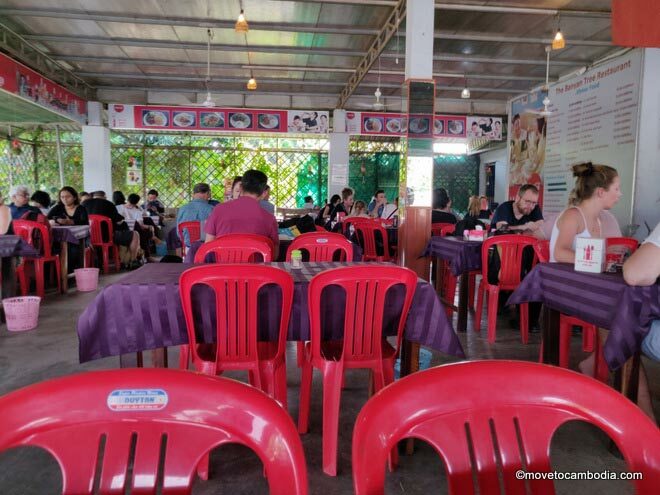 They serve Western and Khmer food, such as hamburgers or Khmer curry, and they are efficient enough to make sure everyone has ordered and eaten in less than 30 minutes. And while Giant Ibis doesn’t own the place, they do hygiene inspections to make sure that everything is up to their standards. Moreover, the toilets are clean and usually have toilet paper. So overall, I can’t really complain. On board, Giant Ibis offer movies in English, which are generally family-friendly action movies–anything that was once a comic book seems to be fair game. Seats have individual switches for the speakers, so the noise is not too loud for those who aren’t interested in watching the movie, and as time progresses they have been lowering the volume, and sometimes skipping them entirely, perhaps recognizing that no one watches the movie anyway. WiFi is offered onboard, using 3G and 4G. This means that the connection is available when there’s a 3G/4G signal available, which is more than half the journey. It doesn’t work in the more rural parts of the trip, but there’s no avoiding that; this isn’t the fault of Giant Ibis, there is just no mobile service there. The latest exciting addition are individual power outlets on all of the buses between Phnom Penh and Siem Reap. They’re international-style plugs that feature inputs for most standard plugs from around the world. Interior of a Giant Ibis on the Siem Reap to Phnom Penh route. Still looking good! This isn’t the only thing that sets Giant Ibis apart from the other bus companies in Cambodia. 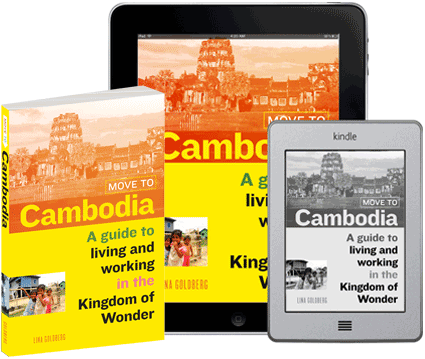 One of my favorite things about the journey is that it does not involve multiple pickups and dropoffs along the way–previous expat favorite Mekong Express often takes an hour just getting in and out of Phnom Penh due to the extra stops. The best thing about Giant Ibis, though, is safety. They have a maximum speed of 95 kph/60 mph, and management is alerted automatically if drivers go over this speed. The company has ten full-time mechanics and their dedication to safety seems very genuine. They are also more reliable than the local airlines that ply this route, who often cancel flights if they deem them not profitable enough, leaving people stranded and with little recourse other than to wait an extra day. 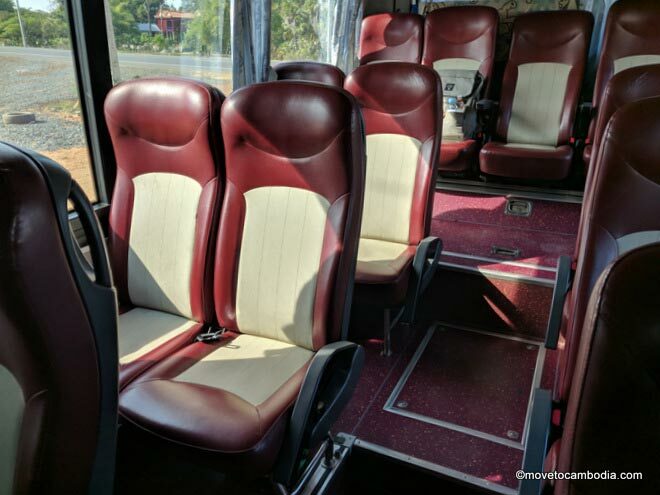 Of course everything on Giant Ibis is not perfect–the seats are narrow enough that it’s unpleasant to sit next to a large stranger, but they have more legroom than any of the mini-buses, and the ride is smoother and more comfortable than on a mini-bus. Currently, buses run from Phnom Penh to Siem Reap at 8:45 a.m., 9:45 a.m. and 12:30 p.m., the schedule is the same in the opposite direction, with buses from Siem Reap to Phnom Penh at 8:45 a.m., 9:45 a.m. and 12:30 p.m. as well. They also have a night bus service in both directions at 11:00 p.m. and and 11:30 p.m which I’ve taken many times and was pleasantly surprised. Tickets on the Giant Ibis Phnom Penh to Siem Reap route cost $15, and prices are the same for locals and foreigners. You can buy tickets online and choose your seats in advance. Giant Ibis buses drop off in Phnom Penh at the new Giant Ibis terminal near Wat Phnom on Street 90 [map] and at the Giant Ibis bus station in Siem Reap [map]. Some links in this post generate affiliate sales for us. This does not affect our reviews for specific bus companies or routes! For more about how we deal with advertising, affiliate sales, and stuff like that, you can read more here. This entry was posted in Transportation and tagged Giant Ibis, Mekong Express, Phnom Penh to Siem Reap, Siem Reap to Phnom Penh. Bookmark the permalink. Is there any GIANT BUS daily-weekly- monthly pass ? can i ask if is there any alternative to Giant Ibis night bus from Siem Reap to Sihanoukville (via or not Phnom Penn? Despite any complaints, the Giant Ibis is still the best night bus in Cambodia. Personally, I do not trust any of the other companies. The bus from Siem Reap arrives very early, with more than enough time to connect to the bus to Sihanoukville. You can also fly from Siem Reap to Sihanoukville. I would like to re-sell a ticket from Siem Reap to Phnom Penh, depart at 11:00 PM – Dec 30, 2015 – with lower price: $12 (original price from GiantIbis is $15 + $1 credit card processing fee). Please contact me via email [email protected], I will send you details about the booking and we can discuss further. Thanks! Reason: I booked 3 tickets, yet unfortunately, one of my friend cancelled her trip at the last minute. And GiantIbis does not refund if I cancel the ticket. Sorry if my comment bothers you guys. Sorry Lina for my spam. You can remove it after Dec 30, thank you so much! I’ll let it slide because it’s Christmas. No more, though, please! –> So it’s not limited to the date I posted above, I can exchange it to any departure time that suitable for you. SPEEDING IS A NO GO>?? PLS.BUS CO.SHOULD PRINT OUT SIGNAGE IN KHMER AND ENGLISH ON THE BUS FOR ALL PAX. AS CUSTOMERS TO CALL BUS CENTRE/STATION TO REPORT RE DRIVERS SPEEDING; CARELESS DRIVING OR WITH THE PHONE WHILE DRIVING? YOUR REPUTATION AND OUR SAFETY IS NO. 1. Speeding, well if they just had a GPS system and a way to Identify the Driver they might be able to ensure no more speeding ? Hi Matt, if you search on Google Maps you can find them that way, or if you look at the maps I’ve linked to have a look for the blue icon that says Giant Ibis.